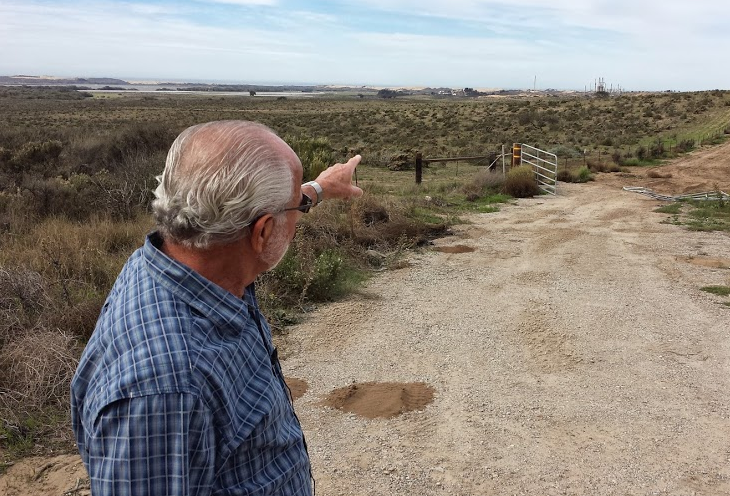 Mesa Refinery Watch Group spokesperson Laurance Shinderman points to the Phillips 66 refinery on the horizon. A plan to add rail delivery of crude oil to the plant is not sitting well with some neighbors. Large construction projects are visible in and around the western edge of the Trilogy community on the Nipomo Mesa, where views of the Oceano Dunes and Pacific Ocean are a big selling point. However, on the same horizon sits the Phillips 66 Santa Maria Refinery. Most home and business owners in the area were well aware of the oil processing plant to the west when they purchased their properties. In fact, some even say the refinery has been a relatively good neighbor. But, the facility's push to extend current railroad tracks, allowing for the rail shipment of crude oil directly to the plant, changes the equation. Shinderman says he chose to retire in the area because of its location and beauty, and is working to maintain those surroundings as one of the leaders of the Mesa Refinery Watch Group. His community is starting to listen too, with some 200 people turning out for an informational meeting held by the group earlier this month. Concerns over the rail plan extend far beyond immediate neighbors to the refinery. Shinderman says communities all along the existing Union Pacific main line would be exposed to rail cars filled with crude oil passing through at an increased rate, including San Luis Obispo to the north and Santa Barbara to the south. Fear of a disaster like the one that happened in Quebec last year is generating public comment. Phillips 66 says in its Revised Environmental Impact Report, a maximum of 250 trains would arrive for unloading per year carrying upwards of a quarter million barrels of crude oil to the facility each week. The company says there are no plans to ship bakken crude to the plant by rail, the explosive crude involved in the Quebec crash. Phillips 66 is actively promoting the concept that shipping by rail is safe. The company recently debuted for the public a Union Pacific Railroad Training Car in San Luis Obispo, part of an effort to highlight the system's safety features. Aside from the shipping-by-rail concerns, Shinderman is concerned about the hours of idling diesel engines and fumes created during the unloading process, and the large rail yard that will be created to support the incoming trains. "The health and safety of the people is number one," Shinderman said. "Why would you want to introduce toxins and pollutants and potential carcinogenic dust into the area? We already have an air problem." Public comment on the revised Environmental Impact Report ends Monday, Nov. 24 at 4:30 p.m. Comments can be emailed or dropped off in person to the San Luis Obispo County Department of Planning and Building. The San Luis Obispo County Planning Commission is next in line to take up the issue during its meeting scheduled for January 29, 2015.